This is a motor mount upgrade for the Tarot X4 and X6 multirotor frames. It offers a ~20g saving over the standard plastic motor mounts (TL96027-01/02), equating to a significant weight saving of 120g for the X6 and 80g for the X4. Although it’s advertised as a Tarot multirotor upgrade, the mount suits any Φ25mm tube, so it could be fitted to lots of different multicopter frames. Its clamping design makes it easy to attach and position level, while it also has provision to mount an ESC neatly below the motor. The mount uniquely features anti-vibration silicon dampers, which help minimise high frequency vibration transfer to the mainframe; helping to reduce jello effect in your videos and improve flight controller performance. 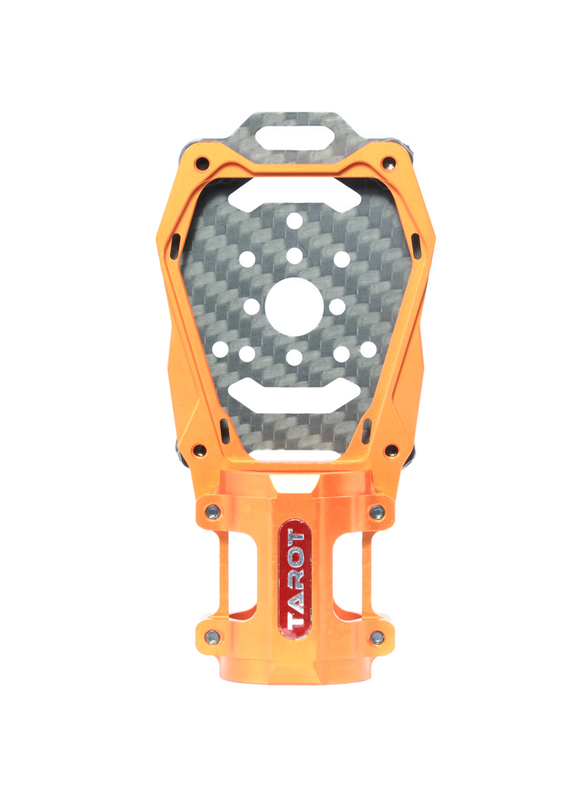 The lightweight mount is CNC machined out of durable 6061 aluminium and strong 3K carbon fibre. The carbon fibre plate has mounting holes configured triangularly, spaced 16mm, 19mm, 25mm and 27mm to suit most motors. The mount is available in two colour options, orange and black. Opting for a combination of both can be used help you to distinguish the orientation of your multirotor in flight.